I found these foam blocks at Target about a year ago. I keep hoping they will resurface--but I haven't seen them yet! They make for a fun sight-word-spelling word game! The students pick a block--read it-write it-stack it! They want to have the tower get as high as possible! This could be done independently, in small groups, and even whole group with bigger blocks. I hope Target sells these again--and soon--I have lots of ideas for these blocks! 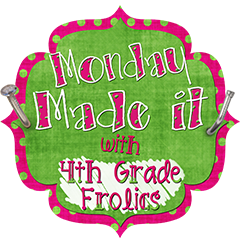 In the meantime--you can get lots of other ideas at 4th Grade Frolics! I am checking you out, as per your request...love what you have going on here...so do you really have no class? It is true--I really do not have a class. I graduated in 2010 with my masters--I am being picky on the district that I work in--I am an assistant kindergarten teacher. WOW...Ihope you find what you are looking for...it can be brutal! <3 your blog! Good idea. I also like the foam shapes because when they topple over it won't cause that crashing sound.